It’s all about the numbers, obviously, so let’s begin there. This is a nicely turned haunted-room tale, with four very excellent aspects to it, and five oddities. Actually it’s a subvariant of the haunted-room tale. The classic would be something like F.Marion Crawford’s “The Upper Berth“, where those who stay overnight in Room 105 on the ship Kamtschatka encounter something pretty grisly, and respond accordingly. This subvarant is probably better termed the “hauntING room tale”, as it’s less a matter of the unsuspecting visitor to the house being at certain times troubled by the room’s occupant, as of the building being at certain times troubled by the room. It begins wth a lightning sketch of its setting, the historic town of Viborg in Denmark: MRJ uses a trick he’s fond of, pastiching the tone of a guide-book, which he immediately and wittily squelches: “But I am not writing a guide-book.” Perhaps he SHOULD have written guide-books; at least they wouldn’t have been boring — this paragraph shifts from “a handsome but almost entirely new cathedral, a charming garden” to the lovingly described assassination by multiple maceblow of King Erik Glipping in 1286, which didn’t even actually HAPPEN in Viborg. But if this is the opening excellence, it also features the first two oddities. The first being that, as per wikipedia at least, King Erik Glipping was *stabbed* 56 times, not bludgeoned: and that this number derives from legend, rather than as discovered (as James claims) by counting the dents in his skull when his tomb was reopened (stabwounds are generally hard to discern on 500-year-old bodies). The second oddity is this: yes these names are fabulous, and yes they are historical. King Erik Glipping was a ne’er-do-well womanising wastrel villain of a monarch, known as “Glipping” — or “Klipping”, the Danish equivalent of “Clipping” — because (a) he blinked a lot, or (b) he WINKED a lot (viz at other men’s wives), or (c) he engaged in cutting little bits of the coin of the realm so as to short-change one and all. And the man MRJ calls Marsk Stig — meaning Marshal Stig — is indeed his historical assassin. Except he is more usually known as Marsk Stig Andersen. Which means that (secretly) he has the same name as the English protagonist of this story: the narrator’s cousin “Mr Anderson”. Is this just a coincidence? It adds nothing concrete to the story except, well, what, exactly? Anyway, Mr Anderson arrives in Viborg for the purposes of historical research, and installs himself in his hotel. He is amused to note that there is NO ROOM NUMBER 13 on the blackboard — brief digression here on the Danish custom at the time of chalking up the name of a room’s occupant by the number of the room occupied. After a satisfactory visit to the library archive he’s back, and getting ready for bed; notes without thinking about it that there is in fact a No.13, whether or not available to stay in; feels something is strange and different about his room; plus can’t find his luggage. While smoking at his window, he also spots the shadow silhouette of his neighbour, like him leaning out and watching the world. But this is mere narrative, which you can read for yourself — we are sweeping past the excellent details, which are worth savouring (I think in some ways this may be my favourite MRJ story). The first (or rather second, after the opening paragraph) is just this: be he the ghost of Mag. Nicolas Francken or whatever he be, he is one of the most excellent inexplicable beings in fiction. 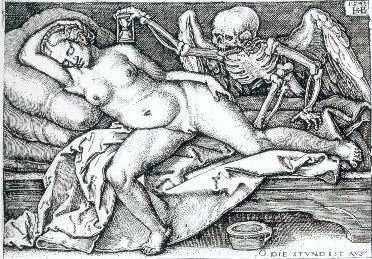 The spook in “The Upper Berth” is — a bit like the skeletal figure in “The Mezzotint’ — a kind of pro forma dead-not-dead revenge-beast, all dank rotting bodyform, still very engaged with the shape and habits of the world it’s supposed to have left. This whatever-it-is is loudly up at all hours, chuckling to itself, breathing heavily at or groping the other guests, basically behaving as if only its own whims and amusements signify. It doesn’t seem troubled in its inability to leave our dimension: exactly the opposite — it’s, well, BOTHERD. If it could dance and yell along to LOUD TECHNO till dawn, selfishly encroaching on the personal space of others — but hey! This is almost exactly what it DOES! Which is Anderson’s expression of amused tolerance: the private quirks of others are their affair. Once the raving starts, it”s like a door flung open on a hidden shame. When I started writing this up, I flirted a little with exploring it as a gay subtext: the highly closeted encounter between Anderson and the landlord — blatantly flimsy pretext to get him to visit Anderson’s room late at night to “smoke a cigar”, which pretext code is neverthless accepted — set against the outrageous public flagrancy of his disco-queen bachelor neighbour. But actually I think this is misleading: projecting a more recent source of homosocial awkwardness, accessible and familiar to us today, back onto something that’s more interesting in its own right, the fourth area of excellent detail. The Englishmen — reserved, observant, laissez faire — is thrown among foreigners trying to work out the etiquette of response and intervention: what counts as unacceptable here, what do we do about it? Is it OK to be scared and embarrassed in public? How are these people so unobservant? OR ARE THEY? Exactly what do they already know about the er Ghoulephant in the Room…? Second: is Anderson the first guest really to notice what’s going on with this room and its occupant? Has it all been manifested just for his benefit — because of his researches? (The landlord says that he heard it once before and thought it was a cat. Perhaps that WAS a cat!) (Or an urban fox…) Whereas “The Mezzotint” has the sense of a “message in a bottle”, a story unfolded so that supernatural justice wll be seen to have been done, no story is unfolded here — we don’t actually know if what they uncover, as the (presumable) cause of the disturbances, has anything whatever to do with Mag. Nicolas Francken; or even if the hotel is actually what remains of of the Archbishop’s house. Third and last, and, well, weirdest of all: how does the ghost room get to land up in the space left for No.13? That’s to say, when the hotel designers were numbering Nos.12 and 14, how did they know to place them on either side of a room that wasn’t there? Or would the room have appeared between wherever Nos.12 and 14 were placed? Footnote: there’s actually one last tantalising detail, which I refuse to number with the others, for my own reasons. The narrator describes a manuscript he’s aware of — which I take to be something real, that MRJ himself had seen (an “astrological work”, with a woodcut frontispiece by Hans Sebald Beham) — with handwriting on the flyleaf: “during the ten years in which I have owned the volume, I have been unable to determine which way up this writing ought to be read, much less what language it is.” The idea of the writing reminds me a little of the Voynich manuscript and the Rohonc Codex — was MRJ aware of either? I guess I want to know if this is another half-obscured clue, or — like Stig and Glipping — a subtle, secret tease. visitor: what happens if i press THIS? massed locals: DON’T DO THAT YOU MASSIVE ENGLISH TW@T!! the “missing” room, slipped between two others, echoes the common device in MRJs tales of the suppressed/hidden story slipped between the pages of an ancient manuscript.